Polyamidamine epiclorohydrin (PAE) resins are widely used to provide permanent wet strength (PWS) properties in the away from home (AfH) towel market. However, high PAE usage can cause operation problems, reducing machine’s operational equipment efficiency (% OEE). In addition, towel producers and consumers occasionally complain about poor re-pulpability, toilet pluggage/dispersability and issues related to environmental disposal. In most AfH towel applications, having long term wet strength “permanence” is not necessary, as the end user requires only a short period of wet strength performance. The expanding use of “hands free” automated dispensing units’ further supports this need for less permanence. Temporary wet strength is actually more desirable as it meets consumers’ needs and can address the manufacturers’ concerns with using PAE chemistries. New novel temporary wet strength (TWS) utilising modified glyoxyalated polyacrylamide (GPAM) technology offers AfH towel manufacturers a variety of benefits and most importantly significantly reduces the use of permanent wet strength (PAE) chemistries. As outlined in a Kemira patent, there is synergistic performance of direct contact addition of both GPAM and PAE chemistries. This technical paper focuses on improving wet end strength performance efficiency, reviewing permanent vs. temporary wet strength requirements and process factors that can affect wet strength performance. The case studies illustrate how using TWS can provide significant beneficial impacts on both sheet quality and machine overall operating efficiency. Polyamidoamine epichlorohydrin (PAE) resins are widely used to provide permanent wet tensile strength sheet properties in the AfH towel market. In most AfH towel applications, having long term wet strength “permanence” is not necessary as the end user requires only a short period of wet strength performance. Test results from a February 2009 laboratory study completed by K. Redway, Department of Biomedical Sciences at the University of Westminster, London, showed that paper towels efficiently dry the hands of users achieving 90% dryness in approximately 10 seconds. Use of medium to high dosages of permanent wet strength (PAE) usage can cause operation problems, reducing the machine’s operational efficiency. This paper reviews the concept of incorporating novel temporary wet strength (TWS) technology and how mills are improving net profit by more than $1.0M/yr. Permanent wet strength (PWS-PAE) technology is very effective in providing wet tensile sheet strength properties, however, there can be quite a few areas within the tissue making process in which PWS-PAE can cause both process and sheet quality issues. formance efficiency (WSPE) is measured as paper wet tensile strength Index over the wet strength resin dosage. An example would be if 10 kg/t of PAE provides a 10 N.m/g CD wet tensile index, then WSPE = 1.0 (kN.m/g). The key to optimum towel production is to maintain the highest strength performance efficiency. Monitoring and tracking the WSPE within a given grade over time and comparisons from grade to grade provide useful insight to understand what fibre, water chemistry and process parameters impact WSPE. In an example of comparing two high basis weigh towel grades (brown versus white) on a wet crepe machine using recycle fibre, a brown towel will have a higher WSPE. This is a result of the higher ash content in the mixed office waste (MOW) furnish in white towel, rendering the PWS-PAE less effective. TWS–GPAM technologies are vastly improved over conventional GPAM technology allowing for both a wider range of cationic charge properties and significantly longer shelf life. 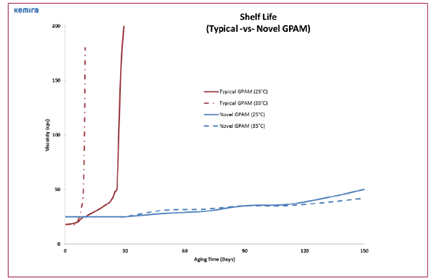 As demonstrated in the table below, conventional GPAM will significantly increase viscosity in a matter of weeks to the point of gelation, while the Fennobond novel GPAM will experience nominal viscosity increase after 90 days. Whether using PWS-PAE and/or TWS-GPAM, it is important to understand and if possible control the process water chemistry to maximise WSPE. The ideal process condition for TWS-GPAM applications is an operating pH of 4.5-7.5, less than; 400ppm hardness (ppm CaCO3), 5ppm sulfite, 150ppm alkalinity and 2,500ppm conductivity (ựS/cm). Laboratory handsheet study using primarily old corrugated container (OCC) furnish in manufacturing brown towel was carried out to compare three conditions; PWS-PAE alone, PWS-PAE with carboxymethycellulose (CMC) at a typical addition ratio of 4:1 and reduced PWS-PAE usage (66% reduction) with TWS-GPAM at a 1:3 ratio. Results demonstrate that using primarily TWS-GPAM with small additions of PWS-PAE resulted in greatest wet and dry tensile. In addition, even though initial wet tensile was significantly increased, the 30 minute soak remained constant. PWS–PAE typically experiences wet strength decay of 25 % or less, while TWS-GPAM technology can be controlled to achieve wet strength decays of more than 60%. The ability for TWS–GPAM to provide faster and greater decay rates than PWS-PAE make it well suited for use in the AfH towel market. A benefit of using TWS in the final towel product is that it can provide the required wet tensile performance while providing faster break down if inadvertently disposed of in a toilet or public sewer treatment and intentional disposal at landfill sites. However, re-utilisation of the wet strength containing broke is one of the towel manufacturers greatest concerns as PWS-PAE is not easily broken in the repulper. PWS containing broke can cause extended re-pulping times (production limitations), need for re-pulping aids (i.e. caustic, hypoclorite, etc) to minimise/eliminate carry through of fibre bundles to the towel machine head box. Fibre bundles will impact both sheet quality and process operating efficiency. 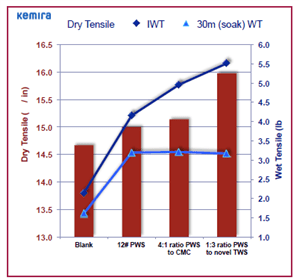 Utilisation of TWS-GPAM has the ability to improve wet tensile decay thus reduce re-pulping time by as much as 33-50%. A tissue mill produces 1 ply, 21# basis wt., unbleached towel grades with 100% OCC on a wet crepe machine. Typical wet end functional chemicals used are PWS-PAE at 7.0lb/tonne (3.2kg/t) and dry strength – CMC at 2.2lbs/tonne (1.0kg/t). The wet and dry strength ratio is typical within the 3.0-4.0: 1 ratio. It was the manufacturer’s desire to increase the WSPE, thus reducing excessive foam, chemical cost, felt deposits and improve machine runnability/productivity. 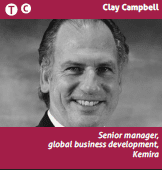 Fennobond TWS-GPAM was added to the thick stock dosage point at 1.6 lb./tonne dry (0.7kg/t). As the wet tensile test increased, PWS-PAE was reduced by 70% to 2.1 lb/tonne dry (0.95kg/t) and the CMC dosage was removed. Over a period of 30 days, the PWS-PAE was completely phased out, using the Fennobond TWS-GPAM at 3.6 lb/tonne dry (1.6kg/t) to provide both the wet and dry tensile requirements. An improvement of more than $800K (600€/yr) net profit was obtained via an increase in grade productivity, 8% lower dryer energy cost (improved drainage) and savings in fibre and chemical costs. A tissue mill produces 2 ply, bleached towel grades using 75% hardwood and 25% softwood furnish for a dry crepe machine. PWS-PAE at 4.0lb/tonne (1.8 kg/t) and an anionic polyacrylamide (APAM) charge control agent at 2.0lbs/tonne (0.9kg/t) were used to keep the head box charge on the anionic side. The manufacturer was frequently adjusting the APAM dosages based on the wet strength impact on the furnish charge. If the head box charge drifted to the cationic side, higher wet strength and defoamer usage would occur with increase felt filling, lower WSPE and slower Yankee dryer speeds. Fennobond TWS-GPAM was added to the thick stock at 2.3lbs/tonne (1.0kg/t) allowing for complete removal of the PWS-PAE and charge control-APAM. A single component addition allowed for ease of application while consistently maintaining an anionic head box charge. The Fennobond TWS-GPAM provided wet and dry tensile flexibility for tensile management similar to the previous. The manufacturer saved $1,000/day (700€/day) as result of increased felt performance, lower chemical spend and fibre substitution mix. A modified TAD tissue machine producing 15lb. towel uses 70% mixed office waste (MOW) and 30% virgin fibre mix. PWS-PAE at 17.0lbs/tonne (7.7 kg/t) and dry strength-APAM at 4.0 lbs/tonne (1.8kg/t) at a fairly constant 4.25:1 ratio for wet and dry strength control. The manufacturer was interested in developing a more robust strength programme that enabled the machine speed increase while increasing the MOW utilisation ratio. Fennobond TWS-GPAM was added to the thick stock at 10.0lbs/tonne (4.5kg/t) allowing the PWS-PAE dosage to be reduced by 44% at 9.5 lbs/tonne (4.3 kg/t) and APAM reduced by 50% to 2.0lbs/tonne (0.9 kg/t). This new wet end functional chemical package allowed the manufacturer to increase the MOW furnish from 70-90%, improve machine speed and system charge balance for excellent runnability. Profit improvement was greater than $1.5M (1.0M€)/yr. Permanent wet strength resins have been used for decades in manufacturing away from home towel grades as a result of no competitive technology. Fennobond temporary wet strength technology can reduce and potentially eliminate permanent wet strength PAE chemistry, offering the AfH towel manufacturers a significant alternative option in managing the wet end process and strength sheet properties. There are several key areas in which the manufacturer can realise benefits from providing a more robust and responsive wet end strength program. There are not only significantly less repulpability, process and product quality issues, but also improvements in machine speeds, chemical cost savings and fibre substitution (lower cost). The utilisation of TWS allows the manufacturer the opportunity to differentiate the final end towel product for market promotion of a more effective end user and environmentally friendly towel. Share the post "Utilising novel temporary wet strength for the AfH towel market. A TW report"